Immingham has been identified as an emergency ferry port to bring in essential supplies in the event of a no-deal Brexit. The Government has paid Danish-ferry firm DFDS to run extra sailings to the Humber port as part of a £100m package to ease potential problems if the Brexit deal collapses. There are concerns if the Brexit deal isn’t agreed before the March 29 planned exit, border checks at British ports could cause major delays, particularly around Dover. 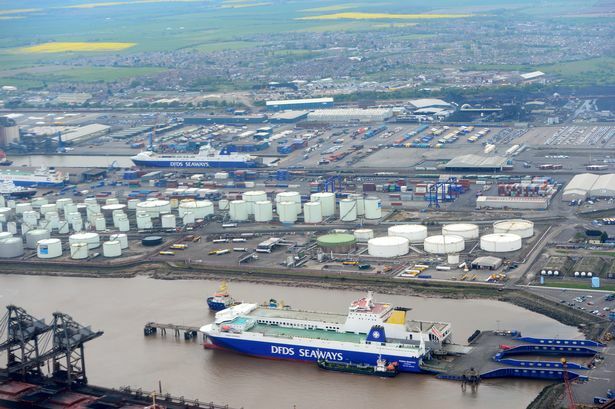 The Department for Transport (DfT) has now signed contracts with Danish company DFDS, a major operator from ABP’s Immingham docks, French firm Brittany Ferries, and the UK’s Seaborne to ensure the “delivery of critical goods” in the event of no deal. It is believed medicines would be one of the priority cargoes covered under the Brexitdeal. 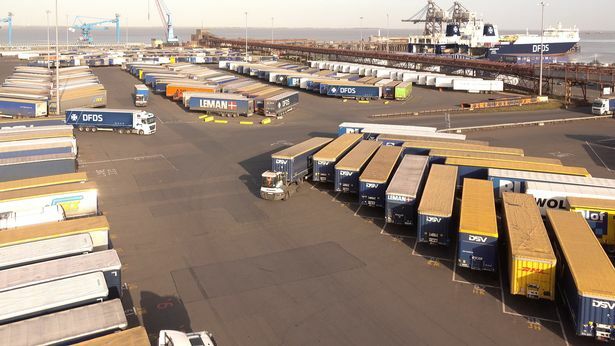 Immingham will be used as an extra site along with Poole, Portsmouth, Plymouth and Felixstowe. DFDS was awarded a contract worth £47.3m, while Seaborne Freight was given a £13.8m deal. The contract with Brittany Ferries is worth £46.6m, with the company adding 19 return sailings to three routes between the UK and France. DFDS currently operates almost 20 return sailings a week between Europe and Immingham, from the ports of Cuxhaven in Germany, Esbjerg in Denmark and Rotterdam in the Netherlands. DFDS chief executive Niels Smedegaard, said in August his company was already preparing for a no-deal Brexit as one potential scenario. He told shipping trade site Lloyds Loading List: “Right now, everybody is in planning mode for both a ‘hard’ and ‘soft’ Brexit. Brittany Ferries chief executive Christophe Mathieu, was reported in the Guardian saying: “Our priority is to prepare for a no-deal Brexit and to create additional capacity. “By increasing the number of rotations on routes like Le Havre-Portsmouth we will be able to meet the Department for Transport’s Brexit requirement. The plans were described as “complete madness” by the Liberal Democrats, who said public money was being spent “recklessly” to prepare for a no-deal outcome. A spokesman for the party said: “It is complete madness to see the Government recklessly handing over £100m on preparing British ports for a no-deal scenario. A spokesman for the DfT said the extra capacity was a “small but important” part of the department’s planning for the possibility of crashing out of the EU without a deal. Technology group Wärtsilä has successfully completed a round of test procedures of its automated dock-to-dock solution, signalling further advancements in rendering automated shipping a reality. In an unprecedented operation, in the presence of the Norwegian Maritime Authority (NMA), the system was tested on the 85-metre long ferry ‘Folgefonn’. The ship visited and docked at three ports. Joonas Makkonen, Vice President, Voyage Solutions, Wärtsilä, said: “This represents a huge step forward in validating automated shipping solutions, and an important progression within our Smart Marine programme. “This emphasises once again Wärtsilä’s recognised position as the global technology leader in marine innovations. The automated docking makes the berthing incredibly easy for an operator. After an operator selects a destination berth, the operation is started by simply selecting “Sail”, which authorises the autonomous controller to take control of the vessel. In the test runs, the ship was able to leave the dock, manoeuvre out of the harbour, sail to the next port of call, manoeuvre through the harbour entrance, and dock alongside the terminal – all without human intervention. It is believed to be the first ever attempt at fully automated dock-to-dock operation, in complete hands-off mode, for a vessel of this size. Nils Haktor Bua, Project Manager at NMA, said: “We were on site for three days as witnesses to these tests; the first full-scale demonstration towards an autonomous operation of a vessel that we have seen. “It was, to say the least, very impressive. “There is no doubt that such technology can eventually increase the safety and overall efficiency of the docking and undocking operations for ships. Japenese marine transportation company Mitsui O.S.K. Lines (MOL) announced that MOL, MOL Techno-Trade, the National Maritime Research Institute (NMRI), and Tokyo University of Marine Science and Technology (TUMSAT) jointly conducted an assessment and feasibility study on advanced navigation support systems, using the NMRI-owned ship handling risk simulator, which has a horizontal view angle of 240°C. On watch-keeping during ship operations, mariners must first be able to see an object, and then judge whether that object poses a risk to the vessel. If that is the case, the vessel must take some action to avoid the risk, such as veering, slow steaming, and so on. The “Obstacle Zone by Target” (OZT) algorithm supports mariners’ ability to spot objects and determine the whether they are potential risks. Conventional collision avoidance is a highly skilled process based on maritime officers’ experience and knowledge. However, by utilizing the navigation support system incorporating OZT, the vessel collision avoidance algorithm, a vessel can find an area where it can navigate safely. In addition, the system’s bridge view display allows mariners to determine the positions of nearby vessels and decide which ones present risks. MOL and its partners continue research and development toward realization of augmented reality (AR) technology, which overlaps displays of information from the Automatic Identification System (AIS) and radar, camera images from the bridge, and advanced navigation support systems, with the long-range goal of autonomous sailing and automatic collision prevention utilizing OZT. China is planning to build 30 logistics hubs by 2020 and 150 by 2025, according to a new plan jointly released by the country’s top economic planning agency, the National Development and Reform Commission (NDRC), and the Ministry of Transport. According to the plan, China is to build six types of logistics hubs—inland harbor, cargo port, airport, service-oriented port, commerce and trade-oriented port, and inland border port. Some 127 cities were named as qualified locations for the project, including Shenzhen, Beijing Tianjin, Nanjing, Shanghai, Guangzhou, Zhenzhou, Foshan, Xi’an, and Fuzhou. Logistics hubs will be encouraged to build automatic ports and smart warehouses and use unmanned vehicles, robots, and drones to increase efficiency, according to the report. The government also aims to establish high-efficiency logistics services, which includes boosting parcel-delivery capabilities. The plan also calls for the development of express capabilities for air, high-speed rail, cold-chain, and e-commerce, and cross-border delivery will be encouraged. Strengthening e-commerce logistics capabilities and rural e-commerce are also part of the plan. Companies are encouraged to develop new logistics businesses such as fresh produce e-commerce and cold-chain delivery. In the first 10 months of 2018, China’s logistics sector carried about RMB 231.5 trillion ($33.3 trillion) worth of goods, according to China Federation of Logistics and Purchasing, or 6.6% year-on-year growth. Even though the logistics cost to GDP ratio has been declining over the past few years in China, the ratio is still significantly higher than in many developed countries and even some developing economies. “The logistics sector is the groundwork of strategic importance for the development of market economy,” Chinese Premier Li Keqiang said at a State Council meeting last year. He added that lowering logistics costs and raising the efficiency should be a priority. One of the targets for the new logistic hubs is to lower the cost of logistics to GDP to about 12%. That number was 14.5% in 2017. The government also sees lowering cost and increasing efficiency in logistics as a way to create a more favorable environment for the development of real economy, and has pushed out more favorable measures such as reducing tax to lighten the burden on companies. Ports and airports received a wake-up call on the disruptive impact of drones last week as a UK airport was closed for more than a day by unmanned aerial vehicles. More than 750 flights and 125,000 passengers were affected when London Gatwick was closed by drones for 1.5 days. Authorities cancelled all flights to and from Gatwick airport on Wednesday night and Thursday (20 December), with flights finally recommencing on 21 December. Although unmanned aerial vehicles (UAVs) are less dangerous to shipping than aircraft, they can still disrupt maritime operations. For example, as a disruptor to crane operations in a port or as a tool for signal jamming, conversation intercepting or system hacking. These are some of the reasons why the Port of Amsterdam started a pilot project with a drone detection company to gain a better understanding of negative and positive UAV operations. Martek Marine Systems is providing its marine anti-drone system for this detection project. It will allow the port operator to understand current and future drone use and identify threats to port infrastructure, shipping and harbour operations from UAVs. There are lessons to be learnt from this week’s Gatwick airport closure as authorities were still searching for the UAVs and the pilots that successfully closed the runway for around 36 hours. UK transport secretary Chris Grayling said drone activity around Gatwick was unprecedented and that these levels of disruption have not been encountered before. He then explained that mitigating processes were in place and measures were enacted to prevent this from happening again. Police were given authority to shoot down any drones that they considered would cause disruption to airline operations. However, a UAV pilot/s have demonstrated how drones can cause disruption. Ports, whether they are air or sea ports, need to use this as a wake-up call and take the example of the Port of Amsterdam and begin reviewing methods to detect, manage and prevent drones from affecting port operations. The Bulkcarrier LORDSHIP left Port of Rotterdam on December 24th, assisted by 3 Multratug tugboats underway to Dunkirk, France. HEROIC Falmouth pilot Captain Tristan Gurd is the man who coordinated the successful refloating of the stricken Russian bulk carrier Kuzma Minin after it had dragged anchor and grounded near Gyllynvase beach last week. The pilot boat Arrow could not board the pilot to the ship due to gale force winds and a heavy swell. The Coastguard helicopter landed at the Falmouth Rugby club where Tristan was embarked, taken to the ship and winched down onto the deck of the bulker. From the ship’s bridge Tristan assessed the situation before deploying tugs and workboats in variety of positions to tow the ship off. Listening on the radio as the operation unfolded I can say Tristan acted with consummate professionalism throughout. Warm words of praise must go to the crews of the various tugs, workboats, pilot boat and lifeboat who all played a part in what started as a very dangerous operation. Luckily the gale force winds had abated just on high water allowing all of the towing vessels to pull the ship into deeper water. Falmouth Docks and Engineering Company (FDEC) part of the A&P Group, has praised the agility of its marine operations team as they worked as part of the emergency response effort to refloat the ship. “From the Coast Guard’s initial response yesterday, we had three harbour tugs on stand-by and worked as part of a combined emergency response team with the Falmouth Harbour Commissioners and the Maritime Coast Guard Agency (MCA). We are grateful to Fowey Harbour Commissioners also, who provided a fourth tug in time to support the extraction of the stricken vessel. We are delighted that the vessel has now been safely re-anchored without any incident and that a positive outcome has been achieved. A Port State Inspection by MCA Surveyors took place in the early evening of 18 December and confirmed a breach in one of the fuel tanks. Tank readings indicate the tank has filled with water as a consequence of the grounding, however no pollution has been reported. The vessel has subsequently been detained by the MCA and directed not to leave Falmouth Bay until acceptable repairs have been made. Further inspections by divers and Class are also expected to take place. Once the repairs have taken place, a follow-up inspection will be made before the vessel can be released. The vessel has full electrical and engine power, and all crew onboard are safe and well. The Secretary of State’s Representaive (SOSREP) is liaising with the owners of the vessel and the Marine Accident Investigation Branch (MAIB) have also been sent to Falmouth. The SOSREP, MCA, Falmouth Harbour Commissioners, Cornwall Council and the Standing Environment Group continue to liaise and monitor the situation. OSLO: December 21, 2018. Hyon, a fuel-cell joint venture owned by Hexagon Composites, Nel and PowerCell Sweden, has been awarded grants to develop and produce a high-speed ferry and a short-sea freighter powered by hydrogen. The funding is provided by a PILOT-E scheme set up by the Norwegian Research Council, Innovation Norway and Enova. ‘Project ZEFF’, a zero-emission fast ferry designed to carry up to 300 passengers, will be powered by hydrogen and batteries with a cruise speed of 25-45 knots using hydrofoils. ‘Project SeaShuttle’ will be a zero-emission short-sea container ship with automated cargo handling and powered by hydrogen and fuel cells. Hyon will use PowerCell for the fuel cells, Hexagon for hydrogen storage tanks and Nel as the supplier of on-shore hydrogen production and fuelling facilities. Enova is owned by the Norwegian ministry of Climate and Environment with a goal to reduce greenhouse gas emissions, development of energy and climate technology and a strengthened security of supply; Innovation Norway is the government’s vehicle to encourage innovation and development of enterprises and industry; and the Research Council of Norway distributes over US$1 billion a year on research and innovation projects.